Workshop Desktop virtualisation is attracting serious attention as organisations consider the future potential directions for delivering IT applications and services. The successful deployment of desktop virtualisation is ultimately dependent on both IT and end users getting something tangible from the new systems. Many of the advantages of desktop virtualisation are focused around enabling a more centrally manageable and almost by definition more secure and resilient desktop environment. But equally it is as important not to forget the end users and their perception of whatever ends up in front of their eyes and under their fingers. This is especially important when we consider Figure 1 below. 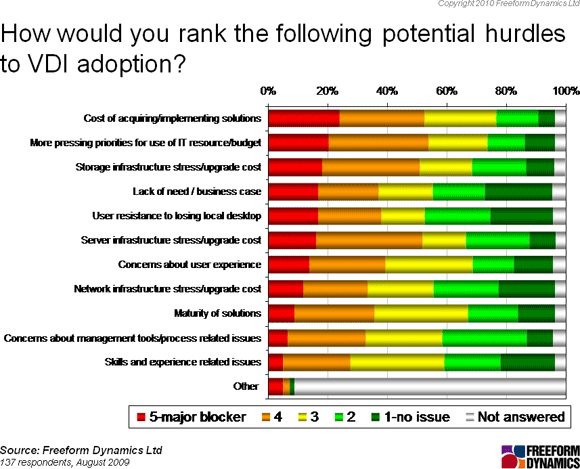 Concerns about user resistance and the overall user experience of VDI solutions feature significantly as potential hurdles to adoption. Mounting concerns over the cost of implementing a VDI infrastructure coupled with the pressure from other projects competing for limited IT budgets can make the case for VDI appear to be on less than solid ground. Conversations we have had with organisations that have started down the road of desktop virtualisation have highlighted that sometimes the unexpectedly high cost of VDI solutions can lead to infrastructure expenditure being tightly constrained. This is especially true if the business case does not take into account the benefits of reduced management overheads, improved reliability, security and support. Cutting back on infrastructure, usually servers and storage systems in VDI projects, can lead to systems that may struggle to deliver the goods, leading to an unhappy end-user experience. Looking at the benefits that are expected to be realised by moving to a VDI, it is clear that for many projects the impetus is really focused on improving the “back end” and overall desktop manageability with not enough thought given to the experience of the end user. While traditional desktop problems such as provisioning, security and support are perceived to be improved, it is equally clear that line of business managers are only marginally happier on balance with the new systems. Even worse, end users either see no improvement or in fact perceive themselves to be worse off, despite tolerating a change in their working environment (Figure 2). We know from experience that unhappy users have the ability to seriously impede the rollout of any new IT service, and in exceptional circumstances cause the rollout to falter, most often terminally, at the first hint of poor service levels. So what is it we are really getting at here? Simply, it is to make sure that the drive to implement VDI is balanced, and takes into account how the business wants to work instead of focusing mostly on the benefits to IT. 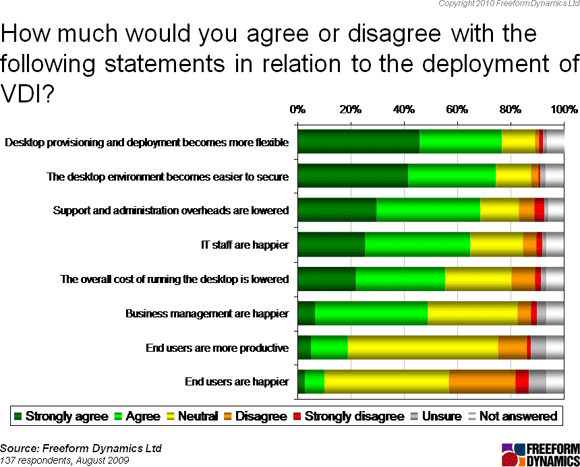 And in turbulent economic times it does not do IT any favours if user perception is poor, especially if this perception is exacerbated by a new desktop virtualisation solution that appears on the surface to be delivering benefits only to the IT support organisation. If the end users, who are, after all, charged with keeping business processes functioning profitably, harbour the idea that they are being made scapegoats to save IT money it is highly likely that the internal political temperature will rise. As a consequence it is essential that every desktop virtualisation project takes pains to ensure that the end users’ experience of the service is good. This in turn may require that a range of metrics be monitored to report on exactly what the state of play is. Indeed, it is well worth benchmarking service levels of IT desktop operations before the desktop virtualisation project kicks off, something that few organisations have so far undertaken. Communicating the improvements in service delivery achieved using desktop virtualisation can help to educate the users on how well things are going compared to the “bad old days”. It is important that what is reported makes sense to non IT-literate users. This means moving away from traditional, highly complex service metrics with which IT often feels most comfortable to making use of reports that ordinary users can take in at a glance, an approach that can make people feel that they are respected by the IT support team. It plugs a hole, but where are the profits?